The study of capacity in seniors over the past 40 years has yielded a good deal of information. A good overview article is Assessment of Capacity in an Aging Society written by Dr. D. Marson et al., the author of the Financial Capacity Instrument (FCI) which is emerging as an important measure of decisional financial capacity. Another good article published in JAMA in 2011 is Finances in the Older Patient with Cognitive Impairment, again with Dr. Marson as one of the authors. They offer a useful definition of financial capacity as “the ability to manage money and financial assets in ways that meet a person’s needs and which are consistent with his/her values and self-interest.” There are many types of capacity (driving, medical decision-making, sexual consent, medication refusal, etc. ), but financial capacity gets the most attention in America's courts. naturally with the case interview process. 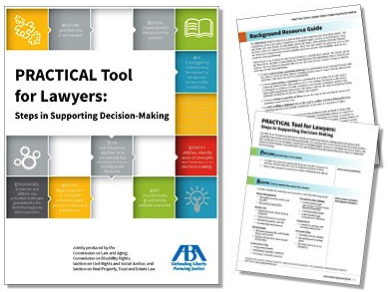 Lawyers serving in different roles may use the steps differently. The PRACTICAL Tool is available for download, and has a nifty tool that can be downloaded or used as a fillablePDF. It is a bit simplistic, but it can serve as documentation of an attorney's screening of capacities with older clients who are making decisions. Remember the "Golden Rule?" Of course, if it triggers concern in any area, then follow-up is needed. In 1998 the Department of Veterans Affairs released a guide for five steps in capacity assessment: referral clarification, general assessment planning, assessment, synthesis of data and communication of findings, and follow-up evaluation. A Practice Guideline for Assessment of Competency and Capacity of the Older Adult. American Psychological Association (APA) available for purchase for $11.95 by members of the APA. Guidelines for Psychological Practice with Older Adults. American Psychological Association (APA). Approved as APA Policy in August, 2003. Assessment of Older Adults with Diminished Capacity: A Handbook for Lawyers. American Bar Association (ABA) & the American Psychological Association (APA), 2003. Judicial Determination of Capacity of Older Adults in Guardianship Proceedings: A Handbook for Judges. ABA, APA, with the National College of Probate Judges, 2006. Assessment of Older Adults with Diminished Capacity: A Handbook for Psychologists. American Psychological Association (APA) & the American Bar Association (ABA), 2008. Assessment of Competency and Capacity of the Older Adult: A Practice Guideline for Psychologists. National Center for Cost Containment Dept. of Veterans Affairs, March, 1997.